The first stop on my parents was for a two night stay at the Biltmore. My sister had two complimentary tickets that we gave to our parents for the tour of the mansion, and then we went together to pay for two nights in the Biltmore resort for our parents. This is the opening spread for the time that they spent there. I selected the colors for this spread based on the color of the folder that their location pictures came in, which is featured on the right hand page. The background paper comes from a Fantasy Paper Stack. The left hand page has their tickets for the museum tours. 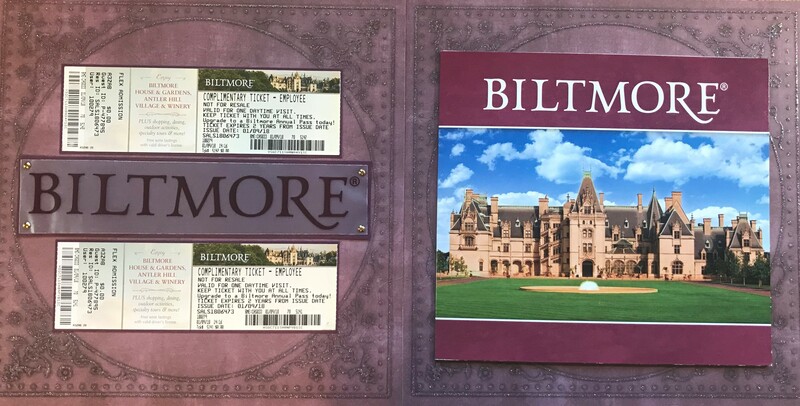 The “Biltmore” title is actually cut from the plastic bag that they received from the gift shop. I attached it to the page with brads as it is see through and you would be able to see other adhesives through it. I used my Crop-A-Dile Big Bite Punch to punch the holes for the brads. The picture folder is attached to the spread in a way that allows it to be opened for the viewer to see the pictures inside. The picture to the right shows what it looks like when it is open. For instructions on how to create an opening folder on a scrapbook page click HERE.